This weekend, jobseekers can rub shoulders with 100 exhibitors offering a wide variety of PMEB/T positions, plus attend free career coaching and resume writing workshops at the STJobs Career and Development Fair 2015. Following the success of a free psychometric tool that was used by more than 500 jobseekers to match fitting jobs to their personalities at the STJobs Express Career Fair earlier this year, STJobs will offer this feature to attendees again in its upcoming annual recruitment fair. Mr Julian Tan, Head of SPH's Digital Division said, "The employment landscape is ever changing. Many reports and surveys in recent years have cited widespread restructuring and a tightening labour market as obstacles to recruiting good talent. "While employers need to be creative in the ways they recruit the right talent, employees too need to continually equip themselves with the right skills, in order to achieve the career progression that they aspire for. This is precisely the reason STJobs continues to organise the career fair. We help to bridge the gap for hirers and jobseekers as a platform for both parties to meet and mingle." Peripheral offerings aside, visitors can meet face-to-face with prospective civil service, MNC and established local hirers from myriad industries such as finance, IT, F&B, retail, and education to check out immediate openings available while updating and submitting their resumes online. Some choice employers include Republic of Singapore Navy, DBS Bank Limited, SIM and Gardens by the Bay, just to name a few. There will be attractive prizes worth $4,000 to be given away at a lucky draw at 6pm daily. 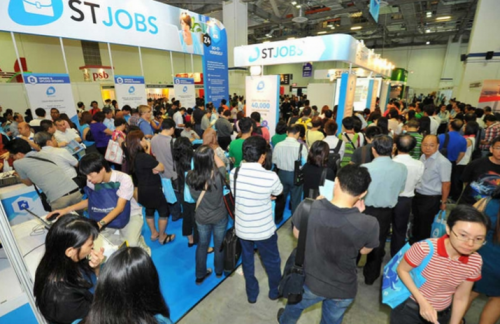 The STJobs Career & Development Fair 2015 will be held on July 4 and 5 (10 am - 7 pm) at Marina Bay Sands Expo Halls D & E. Admission to the fair is free. Singaporeans and PRs are invited for admission on both days. Foreigners with valid work passes or student passes from local institutions are invited for admission on July 5 only. Visitors are encouraged to pre-register to book their preferred activity slots and gain quicker on-site access via www.stjobs.sg/fair by July 3.